Tiamat’s Wrath (affiliate link) is the eighth book in the series. I’m not normally a huge fan of series longer than a trilogy; with the exception of the series I read as a youth (and Harry Potter) I’ve just had a hard time getting into a series to the point that I’m interested in reading a half-dozen or more books about the same characters. Tiamat’s Wrath cover, courtesy of Amazon. the book and Takeshi Kovacs, but I didn’t feel compelled to read the next book, Broken Angels, for a long time, and I still haven’t gotten around to reading Woken Furies. There are stylistic differences between each book, but I’ve enjoyed Morgan’s work quite a bit every time I go to it without feeling compelled to go into the next book right away. However, the Expanse has printed gold, metaphorically speaking, for me. I’ve never had a bad experience with it. The comics are perhaps not always up to the same high standard as the books and TV series (affiliate link; it is free to watch on Amazon Prime), but even they are enjoyable in their own right. So when Tiamat’s Wrath came out I didn’t have to think very long before I got it. All-in-all, it took me two days to complete reading the 545 pages of Tiamat’s Wrath, which was made possible largely by it sucking in the vast majority of my free time on those days. I often describe the Expanse as “Game of Thrones in space” (though my own familiarity with Game of Thrones is limited), and Tiamat’s Wrath is more in line with that description than any prior book in the series: the characters that we follow have become key power players, a stark shift in tone from the underdog stories of Leviathan’s Wake and Caliban’s War. However, the political intrigue remains just as strong as it has always been. The Expanse is willing to kill off characters and centers on grand scale conflict, and the Laconians are the nearest thing it has to an evil empire (though they are not presented as strawman figures; several important Laconians are perspective characters throughout the novel). The timeline has passed quite a bit from the beginning of the story, and most of the original supporting characters are gone; Drummer, for instance, is now a footnote and appears mostly in reference. The original crew of the Rocinante are much older, and the Roci herself only appears in a limited form, because they’ve been scattered. Fan favorites like Avasarala are gone as well, and while it’s something of a shame to read a whole Expanse novel with Avasarala only appearing in memories, it adds to the tension: nothing is the same as it was before. Tiamat’s Wrath moves the series’ perspective closer to the makers of the protomolecule, and while there is still a coyness in how the matters of aliens are discussed it no longer holds the mystique for humanity that it once held. As with the television show, which has moved in this direction more quickly compared to the equivalent point in the timeline of the novels, a lot more emphasis is placed on the mystery surrounding the people who killed the builders of the rings that enable interstellar travel. However, the hard sci-fi flavor is maintained in the novel despite the increased focus on alien life, so series fans won’t have to worry. The good old naval battles and intrigue are unchanged by the advancement of the timeline, and even made more important by events that come up across the novel. If you’ve enjoyed the Expanse up to this point, I think it’s easy to say that Tiamat’s Wrath is a worthy successor. 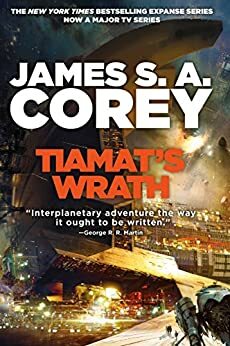 It would not be a good place to pick up the series, but given the consistently high quality of the Expanse it might be worth reading the whole series just to get to Tiamat’s Wrath. It remains unpredictable even after so many books in the series, and there were many moments throughout the book where I was put on the edge of my seat as I read. If there were one complaint, it would have to be that the perspective characters in the novel are all very similar, and we don’t have the deep philosophical musings or political insights of some of the previous characters that the books have focused on, like Avasarala (though Naomi has stepped into a similar role for the resistance against the Laconians) or Volovodov; Holden, Naomi, Alex, Bobbie, and Elvi make a return as perspective characters, and they’re all handled well, but there are only six perspective characters (one is new, and I don’t want to spoil their identity) throughout the novel. This isn’t so small as to be a serious problem, but we’re very familiar with the world of the Expanse and I preferred the more mercurial perspectives of Babylon’s Ashes and Persepolis Rising. I suppose that some of this could be a compensation to avoid confusion; the more characters there are, the harder it becomes to really follow them through the course of the novel as the setting shifts. Tiamat’s Wrath has a fairly large gap in the timeline between it and the prior novel. I would never complain about Leviathan’s Wake having only four perspective characters, because it was an introduction to a new world and some consistency made it easier to delve into that world and have a deep understanding of the politics and viewpoints its inhabitants reflected. So take that complaint with a grain of salt. Excellent prose, fantastic characters, a deep setting, and high-stakes intrigue are the trademark calling cards of the Expanse, and Tiamat’s Wrath has them all. I highly recommend it.